2019 is the 10th anniversary of the Right to Information Act and Information Privacy Act. This milestone presents an opportunity to reflect on Queensland’s journey towards a more open, transparent and accountable government that respects and protects personal information. 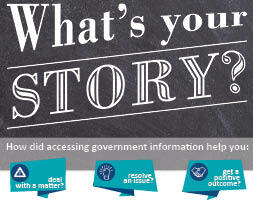 We want to hear your stories, your personal journeys to access, release or protect information over the last 10 years. We also want to hear your ideas about opportunities and challenges for the next 5-10 years. Submissions close 7 January 2019. How will the Office of the Information Commissioner select stories for publishing? We’re looking for stories that show the range of different ways that right to information and information privacy have impacted on Queenslanders. The selection of stories is at the discretion of the OIC. For more information refer to the terms and conditions. Will my story be de-identified? If your story is selected we will consult you to ensure any personal information is protected and respected before publishing. How should I submit my story idea? Please submit your story idea using the downloadable template or online form. Can I send photos and documents to support my story? Please do not send photos and documents with your story ideas. If your story is selected for publishing we will contact you for more information. Your submission must be something that you have experienced, wholly original, except that: you may include things that are in the public domain. You understand that all postings, messages, text, files, images, photos, video, sounds, or other materials (“Content”) posted on, transmitted through, or linked to ‘Tell us your story’, are the sole responsibility of the person from whom such Content originated. More specifically, you are entirely responsible for all Content that you post, email or otherwise make available via our ‘Tell us your story’ form. You must not submit Content that is unlawful, harmful, threatening, abusive, harassing, defamatory, pornographic, libellous, invasive of another’s privacy, or harms minors in any way. You must not submit Content that harasses, degrades, intimidates or is hateful toward an individual or group of individuals on the basis of religion, gender, sexual orientation, race, ethnicity, age, or disability. You must not submit Content that impersonates any person or entity, or falsely states or otherwise misrepresents your affiliation with a person or entity. The publication of any submitted story is at the discretion of the Office of the Information Commissioner, Queensland (OIC). OIC will consult with you if substantive changes are being considered. OIC reserves the right to modify or amend all or any portion of the content which has been selected for publication. OIC will take care to ensure accuracy, including consult with you, as stated above. The ‘Tell us your story’ form will be open until 7 January 2019. OIC reserve the right to alter these Terms & Conditions at any time. You retain ownership in your submission, but by making a submission you give OIC, your irrevocable perpetual permission to disseminate, modify, and use your submission, in whole or in part, in all media now known or later developed, for communication purposes. This permission includes publication in communication channels (websites, social media, print and online publications, newsletters), publicity and promotions. By posting Content to the ‘Tell us your story’ form, you automatically grant, and you represent and warrant that you have the right to grant to OIC an irrevocable, perpetual, non-exclusive, worldwide license to use, copy, perform, display, and distribute said content. Incomplete or incomprehensible entries will be ineligible for publication. OIC is under no obligation to keep, post, or use any submission.